Gaulton Academy of Martial Arts (GAMA) is not a style, system or organisation. It is a core of training material, methods and concepts that form a consistent approach to how we, the GAMA instructors, communicate the arts. Students are taught to own the physical elements of the arts they train in and over a period of time develop superior attributes and fighting skills through this type of training. We have a full time training facility within walking distance from the city centre. The classes are from 18.00 until 21.00 Tuesday to Thursday and 10.00 until 13.00 on Saturday. All classes are open to all levels, from beginner to advanced. Each one hour class starts with a warm up to ensure a safe training session. We then break into the main training, which, depending on the class attended, may cover striking, trapping, sparring, grappling, weapon work or self protection. Given the quantity of material that we have access to, some sessions focus on the technical areas, whereas some are more focused on fight training/conditioning. All classes are designed to develop superior attributes, such as fitness, coordination, timing, reaction speed, power, the understanding of range, etc. Bruce Lee and his partner Dan Inosanto electrified the martial arts world in the late 1960s and early 1970s. Comprised of 26 elemental arts, Bruce’s system, the Jun Fan Martial Arts, is known for its economy of motion and integration of arts. The Jun Fan Gung Fu and Jun Fan Kickboxing curriculum integrates the close range fighting ability of Wing Chun, the stamina and striking ability from Muay Thai, Boxing and Savate as well as the attributes and tools from close range and ground studies from Silat, Judo, Jiu Jitsu, Catch wrestling and other arts. The art that emerged from their research was a compelling and completely new system of training. The guiding principle of this revolutionary art art is personal growth and continued research and development. Our classes are a mix of high energy kickboxing drills, intricate trapping, locking and infighting and occasional ground tactics. You’ll get a good workout and experience why this art changed the martial arts world. Bruce’s curriculum (the Jun Fan Martial Arts) and his art & philosophy (Jeet Kune Do) form the guiding principles of Gaulton Academy of Martial Arts. Bruce Lee and Dan Inosanto sought to eliminate the strict, stylized training that was common at that time and let each student find his/her own way. Elements that would suit many types of students and allow the practitioner to defend against all types of opponents were included and developed. The use of boxing tools like focus mitts and speed bags, the mixing of trapping and grappling methods as well as taking the best techniques and training methods from each art they studied made this new art a dynamic and complete system. Close range sensitivity and energy drills from Wing Chun and Jun Fan Gung Fu are a fundamental part of the Jeet Kune Do practitioners skill set. Our classes set out to expose the student to the training exercises and drills that will enable them to understand an opponent’s energy. The progression of skills in a safe, fun environment are hallmarks of the GAMA Jun Fan / Jeet Kune Do program. You will develop skills, fitness and athleticism! Although the base of the system is weaponry, it’s empty hand systems feature some of the most sophisticated techniques and training methods in existence. The weaponry training covers a wide spectrum featuring stick, blade and knife as well as flexible weapons and weapons of opportunity. Kali is famous for it’s flow drills that are both fun and give a real feel for the movement and speed of combat. 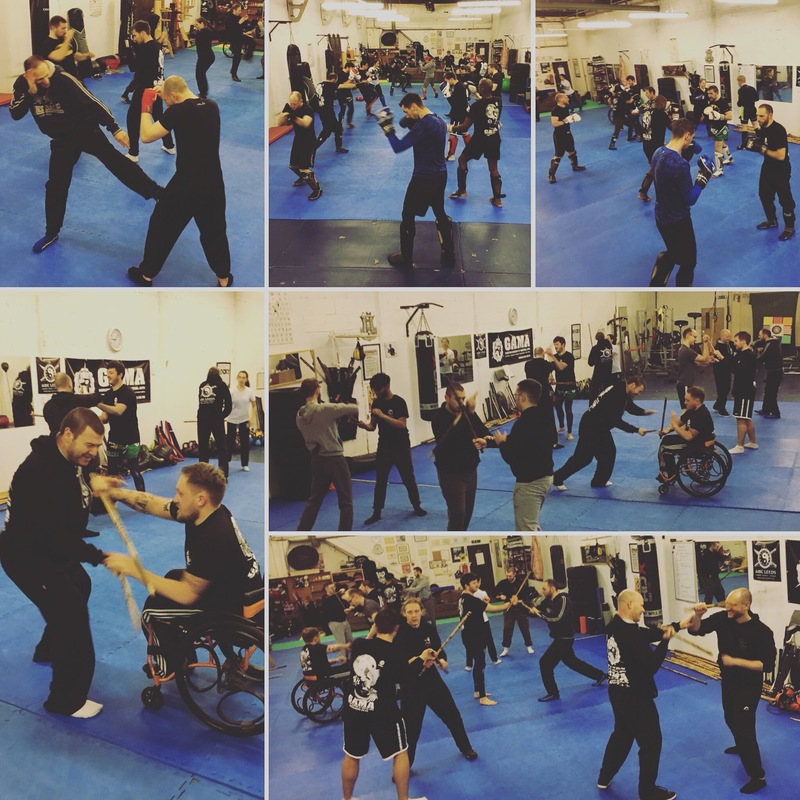 Our Kali program includes classes in the different areas of the Filipino martial arts: two Panantukan (Filipino Boxing) classes and two weaponry classes (Filipino Martial Arts) to cover the spectrum of this art. These fun classes are intellectually and physically stimulating to the martial artist at any level. Personal exploration and discovery, coordination, balance, self defense, health and fitness are just a few benefits of this beautiful and functional art. Sometimes called ‘Dirty Boxing’, Panantukan (Filipino Boxing) (pannan-too-can) is the Filipino Boxing system. This method is traditionally used as a back up system for the weaponry. The self defense skills are obvious from the first day. The health benefits are felt over time as you train both sides of the body and progressively get in better shape. Stress relief, weight loss and true martial art skill are benefits of these classes. The weaponry then helps develop the movement and coordination to perfect the empty hand art. In this class you will be taught a wide variety of strikes. Panantukan uses all possible portions of the hand and fist as well as the elbows, shoulders, hips, knees and feet for striking. Muay Thai – Thai Boxing is the National Sport of Thailand. Muay Thai fighters have been called “Kings of the Ring”. They may strike any part of the body with kicks, knees, punches and elbows. Tuesday 7pm and Thursday 7pm, Muay Thai technique, conditioning and sparring. The Phase I curriculum is designed to expose the student to the different arts that we teach, develop an effective defensive structure, the ability to generate an offense and get them in shape. Improve your fitness, health, coordination, self defense, stress relief and cultural appreciation in this fun and friendly class! The curriculum covers 6 primary arts or methods; Muay Thai Kickboxing, Kali Panantukan, Kali Weaponry, Grappling (BJJ and CSW), Silat and Jun Fan/JKD. The Jun Fan Martial Arts are comprised of Jun Fan Kickboxing, Jun Fan Gung Fu and Jun Fan Grappling. We have found that studying different arts simultaneously is a great way to develop. Each art seems to help the assimilation of the others. In time each student will naturally gravitate towards a specialty that fits their body type, training time, personality, life experience, etc. We emphasize that all the methods will be valid for some students at some time, and so all methods are explored. Our grappling is a mix of Shooto (Shoot Wrestling), Muay Thai, Brazilian Jiu Jitsu and Combat Submission Wrestling, to give our students the most effective mix of arts, to find what works for them, as individuals. Grappling is a great workout. You will develop both your standing and ground grappling game in training AND learn to effectively transition to the ground. If you are interested in training at any of our martial arts classes in Leeds, or would like private lessons, then please email Steve at gama.leeds@gmail.com with a bit about yourself, why you want to train and any experience you've had before.